to urban Canada become a "mosaic" or a "melting pot"? I hope to shed light on this question mainly by the use of primary source material. 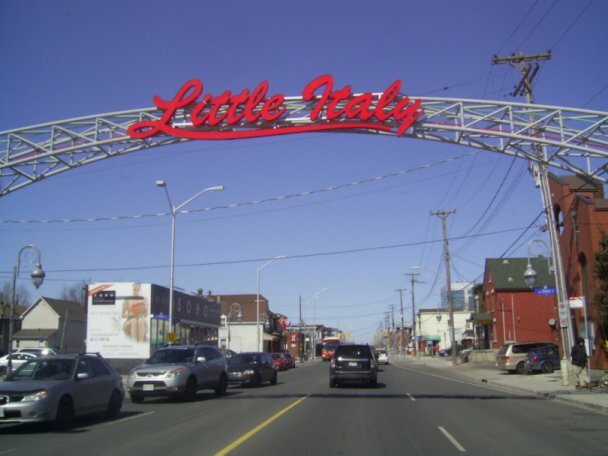 paper, "the neighbourhood" is defined as Dalhousie Ward; "the village" is defined as Ottawa's Little Italy. 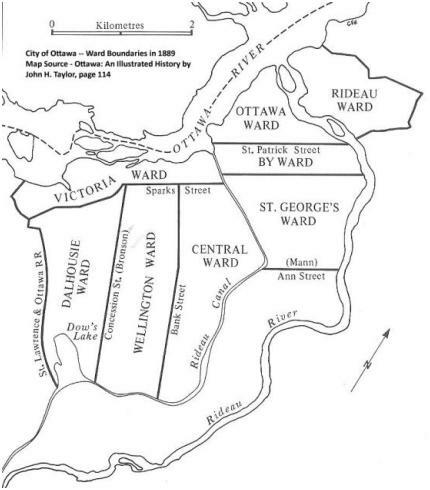 close to the docks where Rideau Canal meets the Ottawa River and in the By Ward Market area between 1846 and 1854. (Bronson Avenue and Nepean Street). of the 1823 Peter Robinson Settlers from west Huntley Township. starting about 1900, to Little Italy. The following Italian heads of households, (all male, average age 36), appear in the 1881 Census for Ottawa Ward in Ottawa. These men were all born in Italy between the years 1836 and 1854 and represent the earliest migrants from Italy to the Ottawa region. No other city ward included Italians in the 1881 census. (the Mormon Church). The 1881 census is also searchable online at www.familysearch.org. there in 1866, a very early immigrant Italian family. Calculina contains four single male lodgers of working age. Abruzzi - Molise (in Southern Italy) had reached a rate of departures surpassing all other Apennine regions". foreshadows single men who would later marry and form families in Little Italy. in 1867, civil service jobs began to slowly open up for residents. All of these jobs were within walking distance for residents of the neighbourhood. 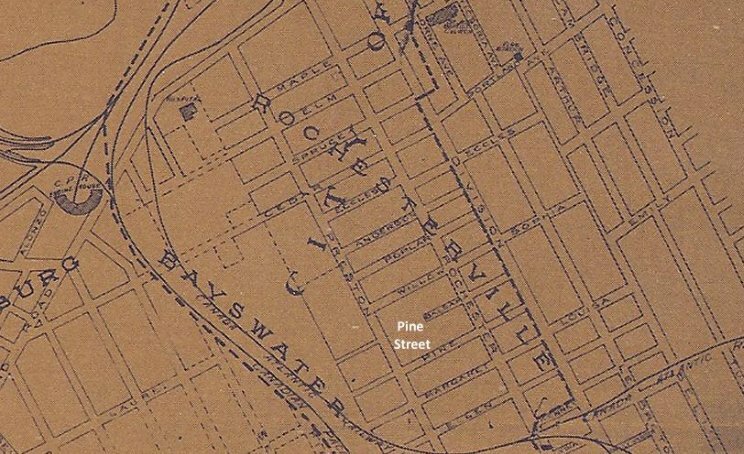 especially after the Federal Mines and Technical Surveys Buildings were built on Booth Street. It was a foot in the door for their descendants. returning soldiers were eligible for the Government of Canada's Veteran's Preference and took up civil service jobs by the thousands. Here is my grandmother's sister, Bertha Christopher, in the 1911 Census who left the farm in 1895, attracted by the lights and sights of Ottawa. Margaret Kirkwood is a widow. Bertha was the leading edge for the Christopher family's urbanization process. Father Ferraro  are further documented by Kathleen Talarico, in her M.A. Essay Standing Shoulder to Shoulder written at Carleton University in 2008. 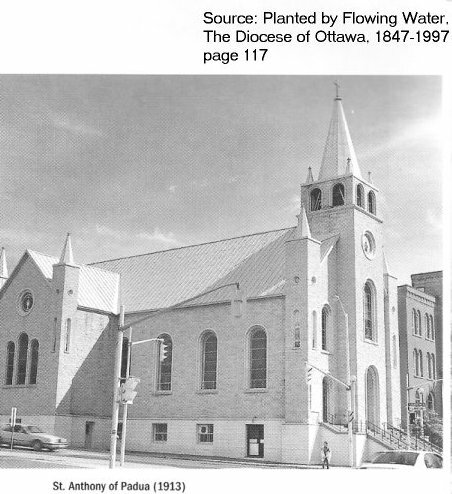 The multi-cultural evolution of St. Anthony's Church can be seen in my own birth certificate shown in Appendix 2. There are two baptisms shown on the page. The top one was performed by Father Ferraro where the mother was Italian. The second baptism was performed by Father Patrick Pharand for an Irish mother (mine). For Irish Catholics, St. Anthony's was the religious centre of their lives. For the Italians, the church was a far-reaching cultural centre as well. Map Source: Planted by Flowing Water, by Mark McGowan, etc. pupil to pupil interaction during school was for First Communion when Grade 3 Catholics were allowed to attend Catechism classes at St. Anthony's School. friendly but not close because of the language differences of Italian and English speakers. shared a building at the corner of Bronson Avenue and Carling Avenue. Many male teenagers attended Ottawa Technichal High School. overwhelmingly grateful that men from their own church and neighbourhood had helped to liberate their homeland. against Roman Catholics, including against the large French speaking  population. The first paragraph of this essay asked whether this microcosm of immigration to the neighbourhood became a "mosaic" or a "melting pot"? Ottawa and the Valley, of all ethnic groups. and neighbours. No proud, upright celtic crosses, no ornate frescoes, just bronze, in-the-ground markers containing names and dates. A loss of some colourful cultural heritage for both groups. (Images and Appendices not included for privacy reasons). 1881 Census of Canada Records contained on a four CD set created by the Church of Jesus Christ of Latter Day Saints (the Mormon Church). The 1881 census is searchable online at at http://www.familysearch.org. (Not as powerful for historical research purposes as is the CD version). "The Founding of St. Anthony's Church in 1903", Extract from How the Italian Mission Was Founded. and Balsam Street. A couple of other streets were / are Margaret Street, Anderson Street and Eccles Street. Map Source: Ottawa In Maps, 1825-1974, by Library and Archives, Canada, 1974, no ISBN, page 35.
from Osgoode Township to Willow Street in 1931. Rochesterville was named after John Rochester.